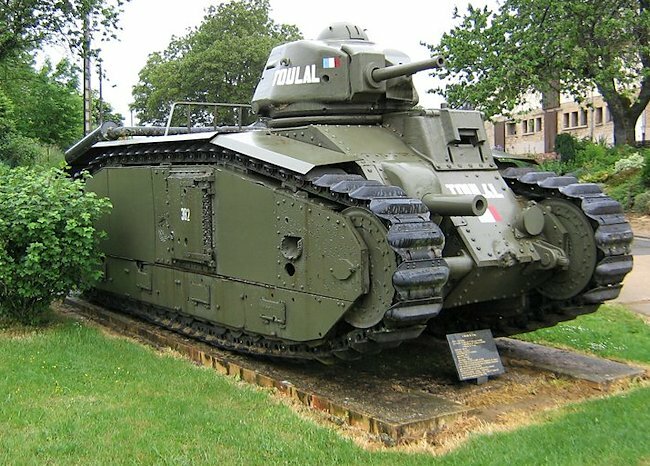 This Char B1 bis Renault French WW2 Heavy Tank can be found on display as a war memorial in the French village of Stonne, 250 km north west of Paris near the border with Belgium. Turret on a Char B1 bis Renault French Heavy Tank. Notice the shell damage to the left of the gun. It did not penetrate the armour due to the cast rounded turret. The Memorial des Combats de Stonne (Battle of Stonne Memorial) and Char B1 bis tank can be found along the Rue du 15 Mai 1940 near the junction with the Rue du Paquis in the village of Stonne in the Ardennes department in northern France. Further East along the Rue du 15 mai 1940 A30 road on the first big bend outside the village there is another tank. It is a French 90mm AMX-13. It is next to a small car park. The word "Char" means tank from "Char de Bataille" which translated means "battle tank". Only three versions were made. The first tank was just called the Char B1. The second version with a bigger main gun was given the suffix "bis". The up-armoured third version was given the suffix "ter". The Renault B1 bis heavy battle tank was the most powerful combat vehicle used on either side during the 1940 invasion of Belgium and France by the Germans. The French built 369 Char B1 bis tanks. It had a 75mm ABS SA 35 howitzer in the hull and a 47mm SA 35 gun in the turret. It weighed 31.5 tonnes and was very slow with a maximum cross country speed of only 21 km/h (13 mph) and on roads 28 km/h (17mph). By the 13th May 1940 the Germans planed invasion of France had crossed the Meuse river near Sedan. They had taken the French and British by surprise by storming through the difficult hilly and rough countryside of the Ardennes. 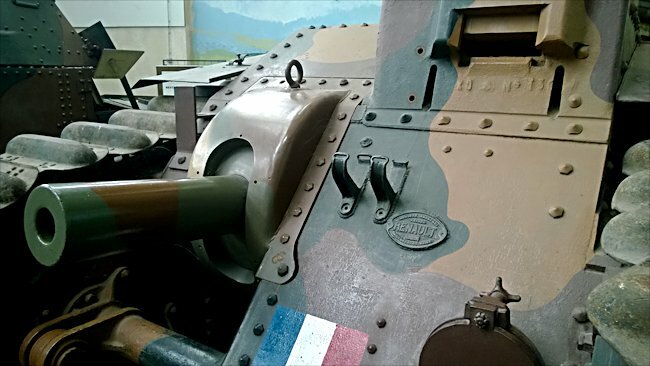 The first French counter using FCM 36 light tanks had resulted in the loss of 24 out of 34 tanks. The Germans headed west through a narrow pass between the hills just north of Chemery. This left his flank extended, poorly defended and open to attack. The French realised this was the opportunity they needed. They sent two battalions of their heaviest tanks the Char B1 straight into the vulnerable German flank. It was crucial for the Germans to keep control of this high advantage point so they could keep control of their bridgehead. The village of Stonne situated on top of a ridge changed hands 17 times betwen 15th may to 17th May 1940. At full strength the French armored division, among other types, boasted over 60 of the Char B1 bis heavy tanks. Due to mechanical problems and battle casualties, only 34 were available by noon May 14th 1940 for the planned counterattack. Only 29 Char BIs were available by the evening. This was the most feared tank for the German tank crews. With 60mm of armour and two large guns, one a 47mm, the other a 75mm, it was their nightmare. On 15th May 1940 the French attacked aiming to take the high ground near the village of Stonne. After a 45 minute artillery barrage,seven Char B1 bis tanks under the command of Captain Pierre Billotte, son of General Billotte, arrived in the village at 5.15am. His tank was named 'Eure'. Seven German panzers were waiting along the road, now called Rue du 15 Mai 1940 (D30), in a tight formation ready to launch a counter attack. The French tanks drove past the present location of the war memorial Char B1 bis tank heading north east past the war memorial building and the bend in the D30 road. Billotte fired at the first and last German tank to prevent them dispersing. He then knocked out the remaining tanks one by one. Seven German tanks were knocked out without any losses to the French tanks. Billotte's tanks carried on driving east along the D30 road out of the village until they came to the junction with the D24. Here he engaged another six German tanks and destroyed them again for no loss. As they drove around the hairpin bend further along the D30 they encountered a concealed German anti-tank gun. It failed to stop the French tanks and was put out of action. At this location you will find a war memorial by a carpark and a preserved French cold wat 90mm AMX-13 tank. As the French Char B1 bis tanks rounded the bend and headed down the hill they engage another German anti-tank gun and knock it out. They returned to the village of Stonne. Billotte claimed his tank crew ahd knocked out 14 German tanks. After battle reports found that two Panzer IV and eleven panzer III tanks had been knocked out anlong with two Pak 36 anti tank guns all belonging to the German 10th Panzer Division. When his tank was examined after the battle it was found to have been hit 140 times but no enemy round pierced the tank's armour. French infantry secured the town and held it until late afternoon. One of Billotte's units tanks was missing. Another was damaged after it drove into a gully and two had broken down with mechanical faults. After the 16th May 1940, both the Germans and the French withdrew their armored forces from the exposed Stonne ridge. The 10th Panzer Division continued to the English Channel. Leon Honor was a member of the crew of a Char B1 in the 49th Tank Battalion 3rd DCR on that day, "The day of the battle was very nice. It was ideal for us. We had great visibility. We could see far into the fields. We had to go into Stonne on a scouting mission, but we did not have a radio fitted to our B1 tanks at that time, so we were on our own. Not only did we have to fight the Germans but we had also to prevent them getting past us. Going up the hill into the village we did not see anything. No sign or contact with the enemy." "We first made contact when German machine guns on the water tower opened fire. We had to fire our 75mm main gun at the water tower. So I drove up to get closer. I had to get into position to fire on the machine gun nest. We just had to eliminate them and then move on. One shot did the job. I carried on driving forward firing the 75mm cannon as we went. Inside the Char B we were very confident that the armour would keep us safe from danger or injury." Hiding in some bushes was a platoon of German anti-tank guns. Their shells just bounced off the strong 60mm frontal armour of the French Char B1-bis tanks. Then one of the French tank commanders did a silly thing. He moved his tank to the right presenting the side of his tank to the Germans. One of the keen eyed Gunners noticed that there was a square grill at the back of the left side of the Char B1. He aimed his gun and fired to that location. The shell went through the armoured metal grill and the tank caught fire. Word spread that the French heavy tanks had a weak spot so all the guns aimed for that same location. The French tank crews decided it was time to retreat and laid down a smoke screen. On 16th May 1940 a single Char B1 attacking a German panzer column near Stonne knocked out thirteen panzers and two German 37mm anti-tank guns. Later examination of its armour revealed that it had been hit 140 times without a single shell penetrating the thick armour. 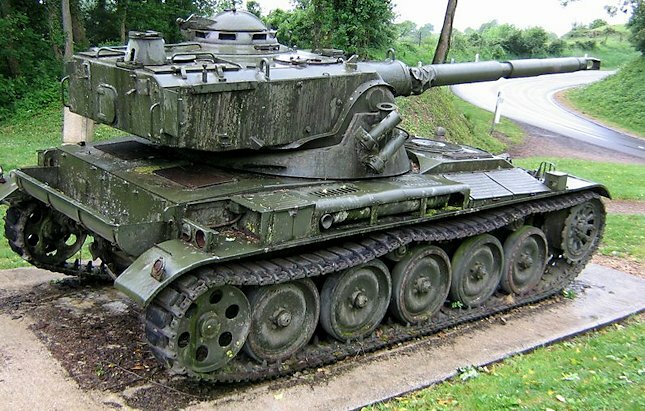 This is the 1960's French Cold War 90mm AMX-13 tank now used as a war memorial just outside the village of Stonne to the east on the D30.